A couple of weeks into term and it feels like Christmas never happened. 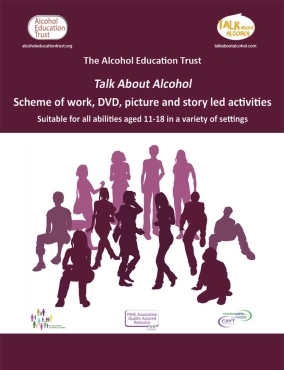 We’ve already held parent support evenings at Brine Leas School in Cheshire and at Torquay Boys' Grammar School and supported the Youth Health Champions programme in Southampton, but most importantly our wonderful hard back resource complete with a DVD, 60 laminated discussion and activity cards, SEN lessons and the new 5th edition of our highly evaluated Talk About Alcohol workbook is now ready and available to order! You can read more below. New hardback Talk About Alcohol resource now available! As our resources are used in a variety of settings and with children of differing ages, abilities and experience, we have worked over the last year to put everything needed together in one set of resources that can be used on a one to one basis, in small groups or for a whole class. 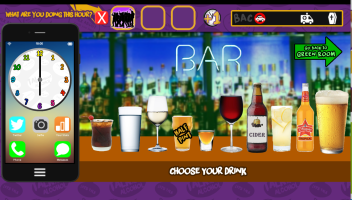 the new fifth edition of our PSHE quality assured and Mentor Adepis CAYT top scoring ‘Talk About Alcohol’ workbook including new games activities, guidance and links to all the relevant sections of www.talkaboutalcohol.com. The 100 page Teacher Workbook of 30 different lesson plans is suitable for different ages 11+, abilities and experience. 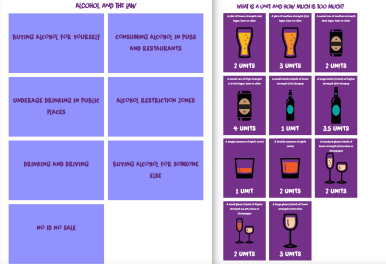 Using 6 lessons over 2 years is shown to effectively raise the age that young people choose to drink. for children with moderate learning difficulties, a set of 6 lessons and specific guidance with access to a password protected website area with powerpoints and additional picture and story led resources. Children with learning difficulties are three times more likely to be abused than the average child and alcohol is used for ‘grooming’. 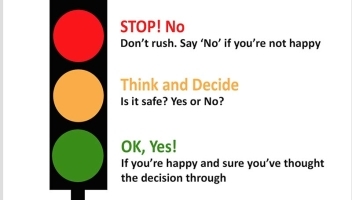 The resources explain and rehearse complex social situations that these young people will encounter as they grow up as well as exploring consent and recognising motivations. 60 laminates of picture and story scenarios, discussion cards, and quiz cards in easy to access pockets that tie into our games and activities or can be used as conversation starters and ice breakers for one to one work or in a classroom setting. 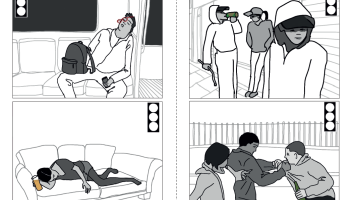 The Talk About Alcohol full resource pack is just £90 including postage and is fully supported on line. To order a copy please email kate@alcoholeducationtrust.org. 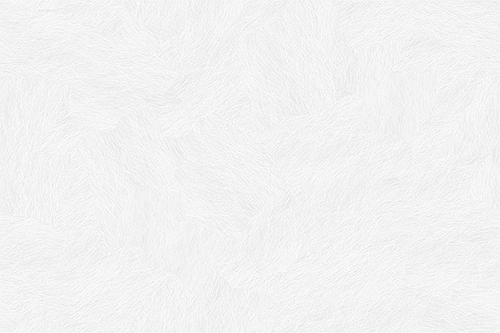 In the coming weeks you will be able to pay by debit card via a new sales area of our website. We do have some of the new packs available free of charge for schools with a high proportion of SEN children, PRUs or for those working with looked after children. Please email Kate if you think you may be eligible. We have 39 on the waiting list already! The published results of a UK adapted version of the highly regarded School Health and Alcohol Harm Reduction Project (SHAHRP) from Australia are expected this week. 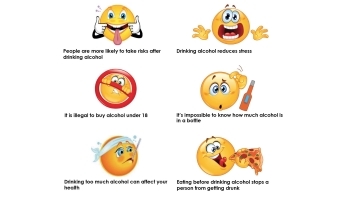 The research trial was called STEPS TOWARDS ALCOHOL MISUSE PREVENTION PROGRAMME (STAMPP). 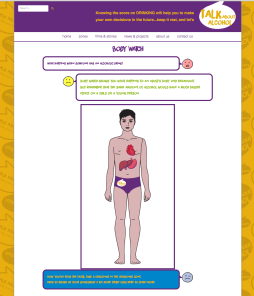 The 5 year trial of STAMPP led by Dr Michael Mckay and Professor Harry Sunmall from Liverpool John Moores University took place in 105 schools in Northern Ireland and Scotland and was funded by NIHR (The National Institute for Health Research). 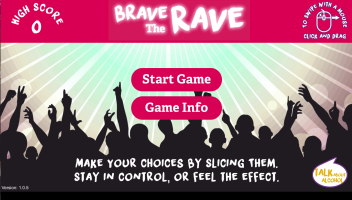 It was a cluster random control trial with schools comparing STAMPP vs alcohol education as normal. Over 12,000 pupils took part with information collected at 4 time points. The Children receiving STAMPP had reduced self-reported drinking compared with education as normal at +33 months (p < 0.001; OR = 0.596). There were no statistical differences in self-reported harms, however, but mainly because they were very low in both groups. The trial evaluation showed that the classroom component engaged, and was enjoyed by, pupils. It was also valued by teachers for its evidence based and structured content. Through its agreement with Curtin University, creators of SHAHRP, the AET is pleased to be able to offer a training day led by Dr Michael McKay on Thursday 27th April with a second date available during the week of the 25th September. Participants will be fully trained in how to deliver the programme, supplied with a teacher training manual and CD of interactive activities and taken through the methodology and practicalities of the programme. 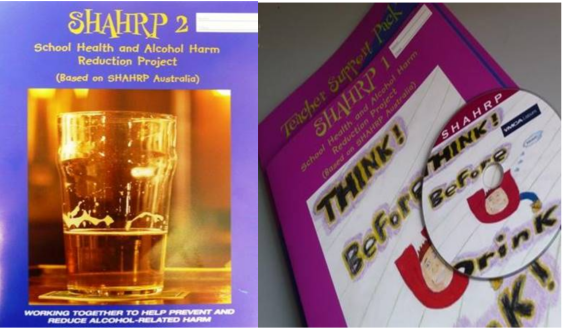 SHAHRP is an example of a harm reduction education intervention which combines a harm reduction philosophy with skills training, education, and activities designed to encourage positive behavioural change. It is a curriculum-based programme with an explicit harm reduction goal and is conducted in two phases over a two year period. 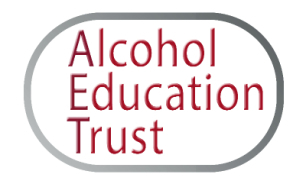 To find out more and to book a place at £195 (for training and materials), please email kate@alcoholeducationtrust.org. Attendees will also have an opportunity to attend a 1 hour 30 minute training session for Talk About Alcohol as part of the day package. Kathryn takes over the North! We were very sad to see Sandra join Hartlepool education team at the end of the year, but are thrilled to say that Kathryn Arnott-Gent, who has led our work in the North West over the last two years, is joining us full time to look after all of the North. Kathryn grew up in the North East with family and friends there and so is looking forward to supporting your school or organisation. Please do email her via kathryn@alcoholeducationtrust.org or ring 07886 532 254 if you would like to book a parent information evening or staff training, or just for advice and support! Finally, as ever, Kate is always in the office to support you with your queries and requests. We are always happy to help, refer, signpost – please do email via kate@alcoholeducationtrust.org or phone on 01300 320 869. 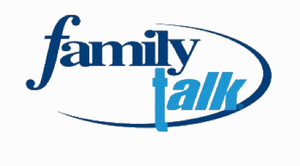 AET resources comprise of www.alcoholeducationtrust.org and www.talkaboutalcohol.com a Teacher Workbook, booklets ‘Alcohol and You’ for 15yrs+ and ‘Talking to Your Kids About Alcohol’ parent and carer guide.